Puppy mills or puppy farms: no, they are not about green pastures, not by a long shot; they are about cages – old, rusty, rotten, steel cages with racks as flooring, in which small bodied dogs are confined with the sole purpose to breed incessantly. Sounds like nothing you‘ve heard? You don’t know what all this is about? Let’s rephrase. Westie or Western or Westland, Yorkshire Terrier or Yorkie, King Charles Cavalier or King Charles spaniel, Spitz, Maltese or Cokie, Shih Tzu, Pinscher, Beagle, Pug and so many others… all these small dogs that everyone wants but no one is really sure how to pronounce. And when you don’t know how to pronounce something would you care where it came from? Probably not. They come from cages; from mothers that breed and give birth all the time. Most of them are ill, emaciated and weak. They can’t go on and yet they’re kept there…in the scorching heat, in the rain and cold. The dogs’ legs may be caught in the grid openings, their nails grow excessively and they suffer a great number of problems caused by the state of permanent immobility. They are fed cheap foods – if of course they are fed daily- the water they drink is dirty, moldy and full of mosquitoes. Feces are piled up for days, creating an ideal environment for flies and disgusting parasites. Imagine the quantities of ammonia in a single day. Breeding takes place in exactly these conditions. Now they come in “mini” sizes – even sicker situations; something like breeding tiny people who will remain short and thin for life. If it is not normal for a child to stay a midget for all his or her life, WHY would you want a mini dog? Why can’t you understand how sick this is? Could it be that your distorted view doesn’t let you see that? These animals are imported massively. They are taken from their mothers much earlier than their first two months of life, which is the most critical period for their health and socialization process. Mothers and fathers have absolutely no medical care. They are not vaccinated, they are not monitored and of course, they are not taken care of. Many are badly injured in the cages. Mothers are given hormones to go on breeding and giving birth more often, which is why their life expectancy is really short. Have you noticed how many “pure bred” animals are not social around other dogs? This is because they have never known what another dog is or what a pack is. Their wholesale prices range from at least 30 to 50 euro. In the glass windows they start from 300 or 350 amounting to 500 or 600 euro. There was a time when they amounted to 1000 euro. Now prices have dropped to make sales. These animals suffer from many health problems. Many die in the first few weeks of life from typhus or canine distemper, diseases very common in puppies. Some shops even replace the puppy to keep the customer happy. The shop can’t lose; replacement is included in the price. 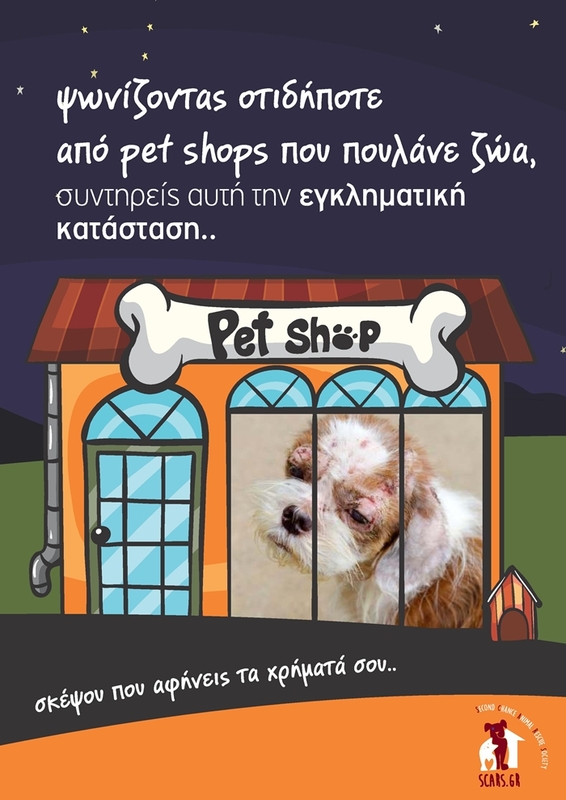 Since puppies are bought at 50 euro and sold at around 400, adding beds, toys and at least five different food supplements that they will sell you, you will have paid at least 500 euro for a possible death. 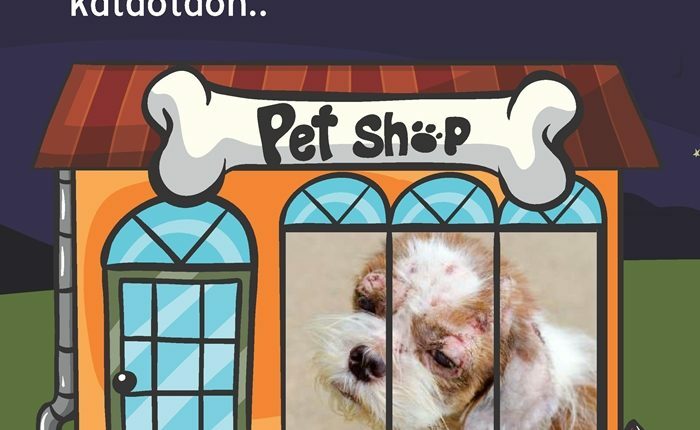 As most puppies are a product of incestuous breeding, they have neurological issues and skin conditions, and most shop window puppies suffer from allergies. Many have skeletal problems (hip dysplasia), endocrinal abnormalities (diabetes or hyperthyroidism) and blood abnormalities (anemia, von Willebrand disease) and deafness. They also suffer from eye conditions such as cataract, glaucoma, progressive retinal atrophy. A large number of imported puppies suffer from mange. Others have behavior problems; they spin around in circles. Most puppies cannot learn to poop outside during the walk, as they have been used to defecating right next to where they eat. Isn’t it like this in the shop windows? This is what is normal for these puppies; that’s what they know. In Greece there are unfortunately many illegal breeding sites. Their merchandise is channeled in the market mostly through shops – supermarkets of souls. They are also put up for sale through ads in the press and the internet. They are the ones showing the idyllic pictures that hide pain and misery all too well. They are the ones under the titles “available” or “new listings”. This vicious circle must end. The more there are people buying from pet shops and illegal breeders, the more orders will be placed and the cages will keep on filling. A simple Google search for “illegal breeding” will produce innumerable results. If you have the stomach for it, click on the images. If you are thinking of buying, definitely click on the images.